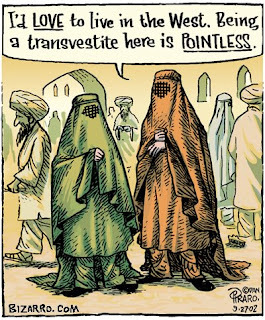 Today's Bizarro is brought to you by Opression Fabrics and Chastity Devices. The cartoon I normally would have posted today is from Earth Day, and I already published it last week on, yes, Earth Day, to go along with the CNN story. See "CNN Scrapes the Barrel's Bottom" in the blog archive list at right. Instead, here's a classic Bizarro, my favorite joke (of mine) ever. It appears in my retrospective, Bizarro and Other Strange Manifestations of the Art of Dan Piraro. If you'd like to buy a nice-quality color print of this, or any Bizarro cartoon, go here. What says, "I love you so much I wanted to give you a funny picture to put on your wall" better than a Bizarro cartoon? Or, what says, "your opinions are so idiotic I wanted to give you a picture making fun of you" better than a Bizarro cartoon? Bizarro prints, the multi-purpose gift for any occasion. Great one! Cheers from Sweden! Ah to hell with it, I'm feeling prodigal today and the awesomeness of the print was too much for me, I tossed it on the pile of debt with the rest of our impulse buys. The print is mine! Seriously, "The Rescue" is really an amazingly great piece. Not like ALL of your art isn't outstanding, but that one just has it all, at least for me and the fully clothed and downright demure wife.